Dating back to the 19th century, the welcoming Villa Primula is the perfect choice for all those who want to live the real charme of Tuscany without the need of relying constantly on a car while on holiday. 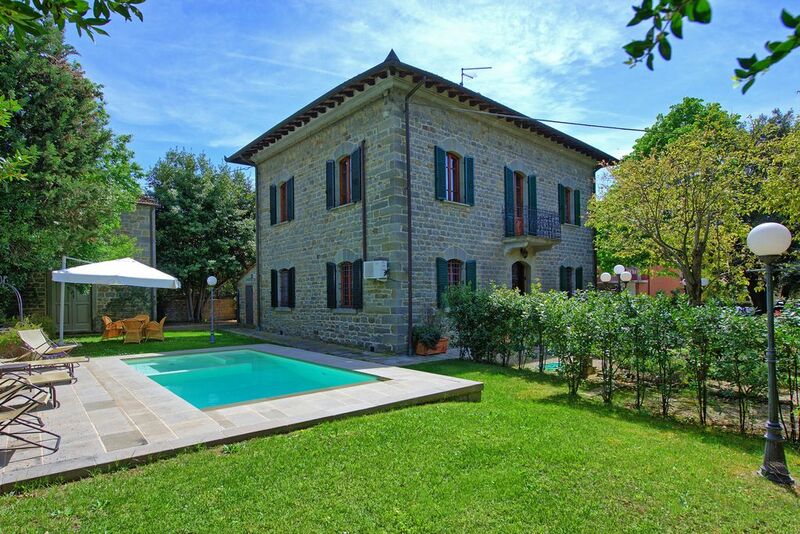 Sleeping up to 9 guests in 5 bedrooms and benefitting from a beautiful private pool, the villa is set just next to the famous Cortona within the traditional town of Camucia with its shops, bars, restaurants and train station. Villa Primula simply ticks all the boxes for a perfect holiday: attractive interiors with antique furniture, large private gardens, private swimming pool, seclusion, air-conditioning, wi-fi internet, village location just steps from shops and unbeatable value for money. The villa is set over 2 floors, was purposedly built as a residence for a local noble family, and is surrounded by fenced gardens providing total privacy, trees and flowers. On the ground floor there is a spacious air-conditioned lounge together with a separate fully equipped kitchen (with fireplace), a bedroom with a single bed and a family shower room. Upstairs there are 4 beautifully decorated and air-conditioned bedrooms (3 doubles and 1 twin) and a family bathroom. The twin bedrom has access to a private terrace providing lovely views over the garden. A further, pleasant, seating area opening onto a 'Juliet balcony' is available at this level. The whole villa has been carefully restored to retain its traditional carachter yet offering all the most modern comforts and extras such air-conditioning, wi-fi internet and a useful private swimming pool. The private swimming pool (available from the 15th of April until the 15th of October) is surrounded by manicured gardens and lush trees providing shade during the hottest hours of the day: it is the ideal place to relax after a day exploring the Tuscan countryside. Take a refreshing dip, or taste a glass of wine comfortably sitting on the provided sunbeds: the real atmosphere of Tuscany and the breeze will caresse you. The swimming pool has been cleverly designed to feature also a seating space and jacuzzi jets: you will have your own hydromassage bath under the Tuscan sun! PLEASE NOTE: The small outbuilding in the garden is used as a storage room by the cleaners, therefore noone will share the grounds or the pool of the villa with our guests. Fantastic villa. Perfect for what we needed. Spacious bedrooms and great facilities. The swimming pool is the perfect size for small children as it is not so big. Great location at the bottom of the climb up to Cortona and walking distance to some shops and restaurants in Camucia. Our family of 6 adults and 2 children had a fantastic stay here. The home was both beautiful and comfortable. Air conditioning worked flawlessly. The pool was perfect, and the kitchen was equipped with everything we needed. Perfect location and easily walkable to the train station. Highly recommended! We had a very pleasant stay at Villa Primula. The villa could easily fit our group of 8 friends (4 couples). We had great fun relaxing and hanging out by the pool to finish the day after our busy tuscan cultural trips. Our host was very uncomplicated and friendly. The beautiful medieval town of Cortona is only a 5 minute drive away and offers amazing sunsets and great food. Thank you Enrico for your warm welcome and your precious recommendations! Our stay at the villa was just fantastic. The villa is well maintained, tastefully furnished e very clean. Enrico and his family were always available for us and they made our stay as easy and as pleasant as possible. Our villa is ideally located within the pretty village of Camucia, just below the famous Cortona. This is the perfect place for all those people that don't want to rely constantly on a car while on holiday: the village offers excellent restaurants, shops as well as a train station all within easy walking distance from the property. Enjoy a walk through the square on thursday to see the market, taste a fantastic pizza or catch a train to visit Florence, Siena, Rome..: Camucia is the perfect base for a turly Tuscan holiday. Additionally the Lake Trasimeno, with beaches and sunbathing opportunities, is just 15 minutes drive away.